Outgoing postcard US-3368790 to Germany was a vintage linen postcard with an aerial view of the Will Rogers Memorial Museum and Tomb in Claremore, Oklahoma that commemorates Native American social commentator and actor Will Rogers (November 4, 1879 – August 15, 1935) who was one of the world's most famous stars in the 1920s and 1930s. 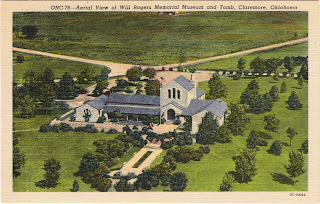 The museum houses artifacts, memorabilia, photographs, and manuscripts pertaining to Rogers' life, and documentaries, speeches, and movies starring Rogers are shown in a theater. He made 71 movies and wrote more than 4,000 nationally syndicated newspaper columns. Rogers died in 1935 during a small airplane crash in Alaska. His tomb is located on its 20-acre or 8-hectare grounds overlooking Claremore and Rogers State University. The museum opened in 1938, three years after his death. May 18 is the International Museum Day. The theme for 2015 is "Museums for a sustainable society."